Some prescription drugs can cause or contribute to the development of depression and other mood disorders. What do certain asthma, acne, malaria, and smoking-cessation prescription drugs have in common? Answer: Their possible side effects include depression or other mood disorders. Depression as a side effect of prescription drugs is widespread and increasingly gaining attention. The medications that contribute to drug-induced depression might surprise you. For example, an asthma medication, Singulair (montelukast), is prescribed to help people breathe more easily, but its side effects may include depression, anxiety, and suicidal thinking, according to a research review published in Pharmacology in 2014. “In 2009, Merck added psychiatric side effects as possible outcomes with Singulair, including tremor, depression, suicidality — suicidal thinking and behavior — and anxiousness,” says J. Douglas Bremner, MD, researcher and professor of psychiatry and radiology at Emory University School of Medicine in Atlanta. Dr. Bremner has published studies on the possible relationship between the use of retinoic acid acne treatments and the development of depression. One of the drugs within this category is Accutane (isotretinoin), the oral treatment for severe acne that has been associated with psychiatric problems, including depression. “The original brand-name version of isotretinoin, Accutane, was taken off the market in 2009, although it continues to be marketed as Roaccutane in the U.K., Australia, and other countries," Bremner notes. "In the U.S. there are three generic versions available that have also been associated with reports of depression and suicide, Sotret, Claravis, and Amnesteem." RELATED: Are You Getting Hooked on Anxiety Medications? The full list of drugs that could cause depression is a long one. British researchers found 110 different medications between 1998 and 2011 that were associated with increased depression risk, according to a report published in BMC Pharmacology and Toxicology in September 2014. Lariam (mefloquine), used to treat malaria. Depression, anxiety, and psychosis are among the side effects of this medication, according to an article in Medical Science Monitor in 2013 that explored the chemical cascade behind mood changes. Chantix (varenicline), used to stop smoking. The Food and Drug Administration (FDA) lists hostility, anxiety, depression, and suicidal thoughts as possible side effects of this medication. Inderal (propranolol hydrochloride) and other drugs in the beta-blocker class, used to treat high blood pressure. Research on beta-blockers and depression suggests that some, but not all, of the medications in this class can contribute to depression, according to a report in the February 2011 issue of the Journal of Clinical Psychopharmacology. Contraceptives. Contraceptives including those delivered by vaginal ring or patch could lead to depression in some people, according to research published in the Cochrane Database of Systematic Reviews in 2010. Corticosteroids. Some people who take corticosteroids experience side effects such as depression, anxiety, and panic attacks, among other symptoms, according to a review of research published in Rheumatology International in 2013. Interferon-alpha. As many as 40 percent of people using this immunologic medication may experience depression, according to a 2009 report in Dialogues in Clinical Neuroscience. Interferon-beta. The link between this immunologic medication and depression is debated, but researchers reporting in Therapeutic Advances in Neurologic Disorders in 2011 note that depression is a concern for those who take it, in part because of their underlying conditions. Nonnucleoside reverse transcriptase inhibitors. These HIV medications may increase the risk for depression, according to research published in the September 2014 issue of HIV Medicine. Arimidex (anastrozole) and aromasin (exemestane). Both of these long-term breast cancer therapies may contribute to depression, according to the FDA. Vigabatrin. This anticonvulsant may cause depression, irritability, and psychosis, notes a review of studies in Acta Neurologica Scandinavica in 2011. The FDA investigates drugs that have many reports of depression symptoms as a side effect. It requires what are called black-box warnings to be clearly printed on medications, like isotretinoin, that have been linked to depression and suicidal behavior, among other serious health threats. Make sure you read the information pamphlets that come with your prescription medications (and ask your pharmacist if you don’t understand what they say). You can stay on top of any news about their side effects by setting up a news alert on Google. You can get the latest drug safety information on the FDA website. Also, pay attention to how you feel. Though you may be taking medications that seem unrelated to mood, let your doctor know if you have symptoms such as sadness, difficulty sleeping, hopelessness, sleep changes, or thoughts of suicide. “If you suspect your medication may be causing depression or similar problems, talk with your doctor and, if necessary, consult with a psychiatrist,” Bremner advises. The good news is that drug-induced depression usually clears up once you stop taking the medication. Are Your Drugs Causing Depression? Timeline. Drug-induced depression is defined as depression that appears within a month of starting or stopping a medication, according to the American Society of Health-System Pharmacists (ASHP). The society also advises that other conditions that might cause depression have to be considered in figuring out whether medication is the contributing factor. Bremner found in his research that the timeline varies from weeks to a month or two. Dose-response relationship. With some drugs, depression symptoms may get better as the dose is reduced or worse as it is increased. This is usually a clear indicator of a relationship. If you are uncertain about whether your changes in mood or energy are drug symptoms, talk with your doctor. Screening tools and questionnaires can reliably identify depression. You can also send information about your experiences to the FDA. Switching to an alternative treatment. If an equally effective medication that does not have depression as a side effect exists, the easiest option is to switch prescription drugs. Getting a psychiatric evaluation. This may be recommended in any case to make sure you do not have an underlying psychiatric condition that has gone undiagnosed. People with a history of depression may have a worse response to some medications. An antidepressant might be prescribed in order to help manage depression symptoms. Talk therapy will not work in this case, says Bremner, because the problem is chemically based. You will need prescription medication to address the depression if you cannot stop taking the drugs that are causing it. If you think your depression symptoms are linked to a prescription drug you’re taking, talk with your doctor right away, get screened for depression, and find a better way to manage both your health issues and your mood. Newer antidepressants target brain chemicals involved in regulating mood, but they're not magic bullets. Here are the risks and benefits of these commonly prescribed drugs. Although mild forms of depression are often treated without medication, those with more severe symptoms may benefit from taking antidepressant drugs. These medications, which target brain chemicals involved in mood, may help people with severe depression who do not respond to talk therapy or healthy lifestyle changes alone, according to the National Alliance on Mental Illness (NAMI). Roughly 67 percent of people living with depression use medication as their primary form of treatment, NAMI reports. Antidepressants are the second most commonly prescribed drugs in the United States, according to a study published in 2013 in the American Journal of Clinical Hypnosis. Overall, use of antidepressants increased from 6.5 percent in 2000 to 10.4 percent by 2010, a study published in 2014 in the Journal of Clinical Psychiatry reveals. There are many theories about what causes depression, according to the National Institute of Mental Health (NIMH). Brain imaging technology shows that parts of the brain involved in mood, thinking, sleep, and behavior look different in people with depression than in those who are not depressed. Genetics, stress, and grief could also trigger depression, according to NIMH. Selective serotonin reuptake inhibitors (SSRIs): SSRIs work by making more of the neurotransmitter serotonin available to your brain. Some of the drug names you may be familiar with are Prozac (fluoxetine), Paxil (paroxetine), and Celexa (citalopram). The most common side effects associated with these medications include sexual problems, headache, nausea, dry mouth, and difficulty sleeping. These symptoms often fade over time, NAMI notes. Atypical antidepressants: This class of drugs includes serotonin-norepinephrine reuptake inhibitors (SNRIs), such as Effexor (venlafaxine) and Cymbalta (duloxetine). In addition to serotonin, these antidepressants may target other brain chemicals such as dopamine or norepinephrine. Side effects of SNRIs are similar to those associated with SSRI drugs. You may also experience, fatigue, weight gain, or blurred vision. The antidepressant Wellbutrin (bupropion) affects only the levels of norepinephrine and dopamine. This drug, known as a norepinephrine and dopamine reuptake inhibitor (NDRI), has similar side effects as SSRIs and SNRIs, but it is less likely to cause sexual problems. Rarely, seizures may occur. Tricyclic antidepressants: Tricyclics also affect levels of brain chemicals, but they are no longer commonly used because they have more side effects, including fatigue, dry mouth, blurred vision, urination difficulties, and constipation. If you have glaucoma, you should not take any tricyclic antidepressant. Some tricyclics antidepressants include amitriptyline, amoxapine, and Norpramin (desipramine). Monoamine oxidase inhibitors (MAOIs): Like tricyclics, MAOIs are now prescribed less often because of their risk for serious side effects. These drugs work by blocking an enzyme called monoamine oxidase, which breaks down the brain chemicals serotonin and norepinephrine. People taking MAOIs can experience dangerous reactions if they eat certain foods, drink alcohol, or take over-the-counter cold medicines. In 2006, the U.S. Food and Drug Administration (FDA) approved Emsam (selegiline), the first skin patch for treating major depression. At its lowest dose, this once-a-day patch can be used without the dietary restrictions associated with oral MAOIs. Some other MAOIs include Marplan (isocarboxazid) and Nardil (phenelzine). In 2005, the FDA warned that the risk of suicidal thoughts or behavior could be higher in children and adolescents taking depression drugs. In 2007, the warning was expanded to include anyone under age 25 taking antidepressants. However, to balance the risks and benefits of antidepressants, the FDA’s so-called black box warning also states that depression itself is associated with a greater risk for suicide, notes a 2014 study published in the New England Journal of Medicine. Nevertheless, if you are taking an antidepressant, especially if you are under 25, let your doctor know if your depression seems to be getting worse or if you have any thoughts of hurting yourself. It's important to remember that simply taking a pill will not cure depression. It may take up to 12 weeks before these drugs have their full effect. Some people need to take various doses or combinations of different medications before they find the treatment strategy that works best for them, according to NAMI. It’s also important to take antidepressants as prescribed and to follow up with your mental health professional on a regular basis. Some depression drugs must be stopped gradually — if you suddenly stop taking your medication, you could experience withdrawal symptoms or a relapse of your depression. Often the most effective treatment for depression involves some form of talk therapy, notes NAMI. Discuss with your doctor how exercise and limiting alcohol can also help ease your symptoms. Part of your next visit to your family doctor's office should be spent filling out a questionnaire to assess whether you're suffering from depression, an influential panel of preventive medicine experts recommends. What's more, people concerned that they might be depressed could download an appropriate questionnaire online, fill it out ahead of time and hand it over to their doctor for evaluation, the panel added. In an updated recommendation released Monday, the U.S. Preventive Services Task Force urged that family doctors regularly screen patients for depression, using standardized questionnaires that detect warning signs of the mental disorder. If a patient shows signs of depression, they would be referred to a specialist for a full-fledged diagnosis and treatment using medication, therapy or a combination of the two, according to the recommendation. These questionnaires can be self-administered in a matter of minutes, with doctors reviewing the results after patients fill out the forms, said Dr. Kirsten Bibbins-Domingo, vice chair of the task force. "This could be a checklist that patients fill out in the waiting room, or at home prior to the visit," she said. "The good thing is we have many instruments, measures that have been studied for screening for depression." About 7 percent of adults in the United States currently suffer from depression, but only half have been diagnosed with the condition, said Bibbins-Domingo, who is a professor of medicine, epidemiology and biostatistics at the University of California, San Francisco. "We know that depression itself is a source of poor health," she said. "It leads people to miss work, to not function as fully as they might, and we know it is linked and associated with other types of chronic diseases." It makes sense that family doctors perform front-line screening for depression, since they are more likely than a mental health professional to come across a person with undetected symptoms, said Michael Yapko, a clinical psychologist and internationally recognized depression expert based in Fallbrook, Calif.
"Only about 25 percent of depression sufferers seek out professional help, but more than 90 percent will see a physician and present symptoms and signs that could be diagnosed," said Yapko, who is not on the task force. The panel has recommended regular depression screening for adults since 2002, but their guidelines currently urge doctors to ask two specific questions that provide a quick evaluation of a person's mood. The questions are, "Over the past two weeks, have you felt down, depressed, or hopeless?" and "Over the past two weeks, have you felt little interest or pleasure in doing things?" The updated recommendation expands doctors' options for depression screening, adding commonly used questionnaires like the Patient Health Questionnaire, or PHQ-9. The PHQ-9 is a list of 10 questions that focus on problems that a person might have experienced during the past two weeks, including poor appetite, low energy, sleep problems and a lack of interest in doing things. "These are not instruments that diagnose depression," Bibbins-Domingo noted. "They give clinicians the first indication of something that should be followed up on." Yapko said that someone who wanted to could lie on the questionnaires and avoid having their symptoms detected, but he added that in his experience it's not a very likely scenario. "When you have people who are suffering who genuinely want help, they're happy to give you as accurate a portrayal as they can give you," he said. "Generally speaking, the people seeking help want help and they want to do their best in filling these things out. That's what makes the test worthwhile." The task force is an independent, volunteer panel of national experts that has been issuing recommendations on preventive medicine since 1984. Yapko and Bibbins-Domingo said depression screening shouldn't eat into a doctor's time, since patients can fill out and score the questionnaires on their own. Instead of wasting time reading magazines in the waiting room, patients "could be filling out an inventory that is self-administered, self-scored and wouldn't take any physician time at all," Yapko said. Patients also could download and fill out a depression questionnaire at home and hand it in when they go to the doctor, but Yapko said patients should make sure they're using the form their doctor prefers. "Which of the many inventories and questionnaires a doctor might wish to use is a matter of personal and professional judgment," he said. "So, a doctor would need to specify which form to obtain online and the patient would then need to remember to bring it in, not always easy when depression negatively affects your memory. Easier to have the form in the office and have them fill it out in the waiting room." Yapko added that it's important that doctors who screen for depression follow up by referring patients to a mental health professional, rather than trying to diagnose and treat depression themselves. "When physicians get a diagnosis of depression, their most immediate thing to do is prescribe an antidepressant," Yapko said, noting that more than 70 percent of antidepressants are prescribed by non-psychiatrists. "Only a minority of people walk out of a doctor's office with a referral to a mental health professional, a fact which drives me a little crazy." Showing items 1 through 15 of 59. 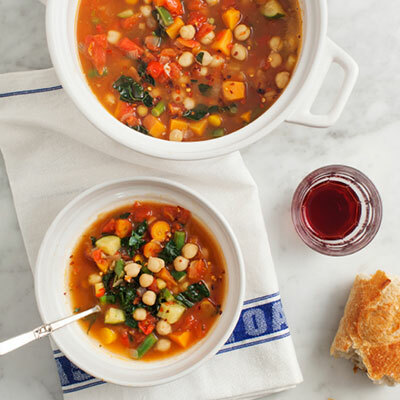 We like to think of this dish from Love & Lemons as the “everything but the kitchen sink” of all soup recipes. Here at Everyday Health, we have a strict “no produce left behind” policy, and this is the perfect way to use up all of those death-row veggies in the fridge. Satiating sweet potatoes and carrots pair with lighter veggies like zucchini, tomatoes, and kale to create a hearty, stew-like dish that makes a delicious winter lunch or light supper. Happiness is when two of your food obsessions (ramen and spiralizing) come together to create a healthy, guilt-free dish. 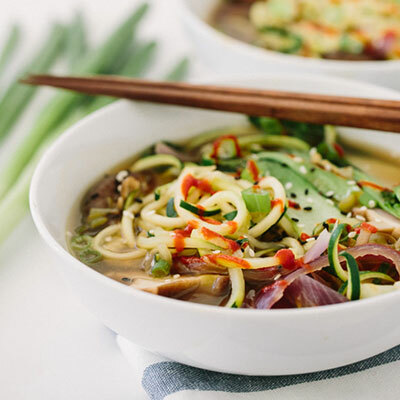 Our friend Ali over at Inspiralized created the ultimate healthy substitute for when you’re jonesing for ramen. This recipe, which swaps noodles for zucchini ribbons, clocks in at 117 calories per serving, which makes it the perfect starter. Or you can make a vegan-friendly meal by adding protein-rich tofu or quinoa — or vegetarian (and a little more authentic!) by serving it with a perfect soft-boiled egg. Here’s another “easy button” recipe that requires just a few essential ingredients that can be swapped in and out depending on what you have in the fridge. Here, cooked spinach, onion, and potatoes are blended with rosemary to create a vegetable-rich savory slurp, but you could use any green you have on hand (think: kale, arugula, mustard greens) and a variety of herbs (thyme, basil, and tarragon would all do the trick!). Eschewing bread this month? Just skip the croutons. If you haven’t hit the supermarket for your annual “New Year, New You” shopping spree, check the crisper for these holiday holdovers: carrots, onions, apples, and ginger. 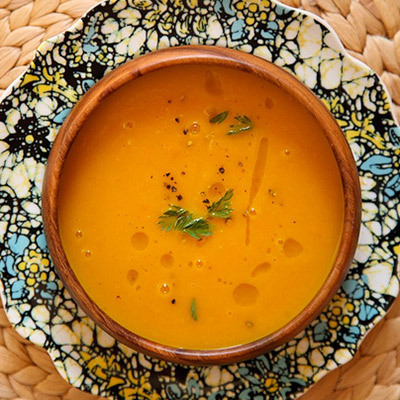 This bright, sweet, and spicy soup from Joy the Baker keeps in the fridge for up to four days and freezes like a dream. Your first week of January lunch problem? Solved! 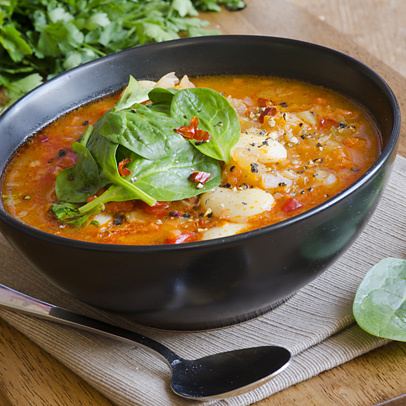 If you’re looking for a vegetarian soup that even the most persnickety carnivore will love, look no further. The United Nations has declared 2016 the “International Year of Pulses” (pulses being beans and legumes to me and you), and for good reason: Beans are cheap, healthy, and environmentally-friendly sources of protein that are packed with fiber and nutrients. We love this wintry mix of beans, carrots, squash, and greens, finished with a squirt of lime. You can easily make this a vegan dish by swapping the butter for heart-healthy olive oil and the chicken stock for a veggie version. 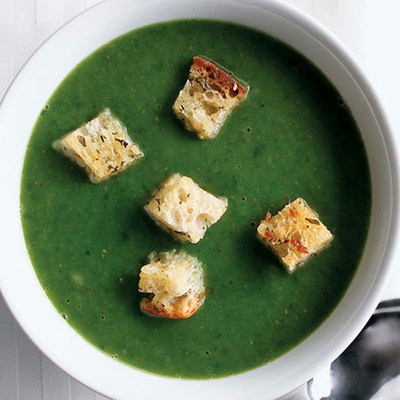 Now that you’ve got five delicious soup ideas, you’ll need some broth. 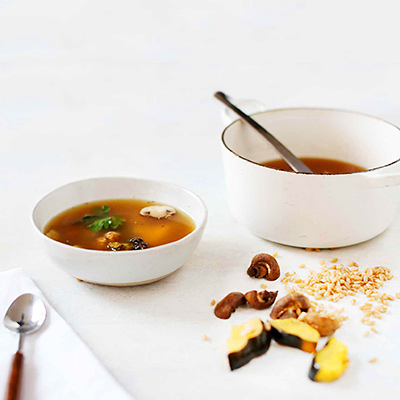 Matt Weingarten, culinary director for Dig Inn, created this No-Bone Broth recipe from kitchen scraps, like apple cores, vegetable peels, and the tops and tails of celery, to create a nutrient-rich, vegan stock that’s a perfect base for any soup recipe. In Figure 2 Teen e-cig users are more likely to start smoking.